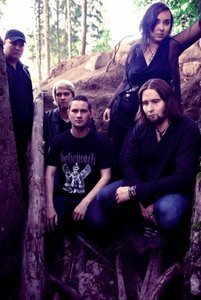 Ablaze In Hatred was formed in 2004 in the town of Helsinki in Finland. In the spring 2005 drummer Antti Hakkala (Searing Meadow) and bassist Miska Lehtivuori (Fall Of The Leafe) joined the band. The group issued a demo in 2005 called Closure Of Life and signed with Firebox Records. Deceptive Awareness was issued in the autumn of 2006. The band played the Petrodoom show in Russia in early 2007. The band completed recording The Quietude Plains album at Noisecamp Studio with producer Kari Nieminen. It was out in February, 2009 through Firedoom Music. The first 1,000 discs came with a bonus CD. Death, doom or dark, whichever the brand of metal best attached to Ablaze In Hatred’s debut Deceptive Awareness, the best word to tag to the Finns is'despair.' Despite the presence of keyboards courtesy of the band’s singer Mika Ikonen and a thankfully departed session player the album keeps the synthesized fakery at bay (and moreover has no female moaning at all) to deliver music that could be described as a cross between My Dying Bride of yore and the funeral doom of bands like Disembowelment and Thergothon.